I’m a big brinner girl. I love eating breakfast for dinner. Who doesn’t love breakfast food to begin with? I just prefer to eat it at night! But this year I’m trying to get myself eating more meals at actual breakfast time. 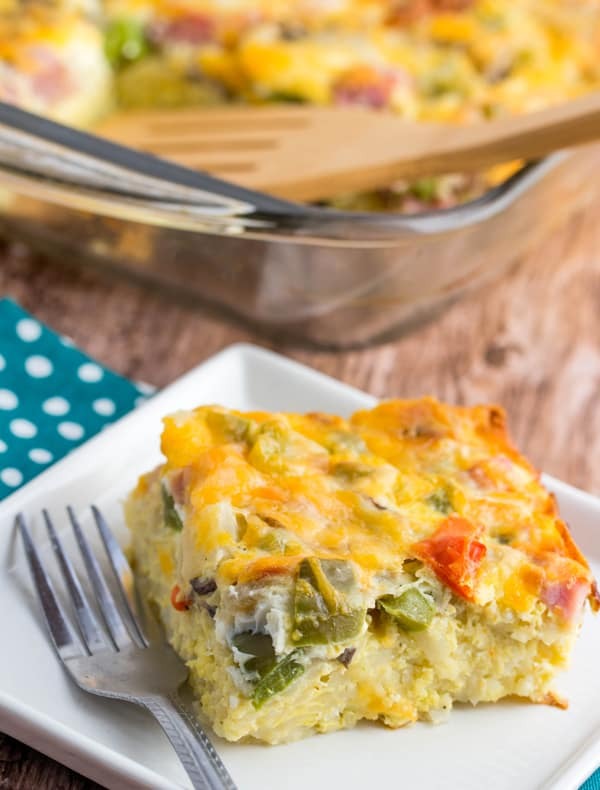 One of those meals happens to be this addicting Western Omelet Bake! I’ve always adored egg bakes, but growing up they were pretty bland, sorry mom!! See my mom is kinda, sorta a picky eater. Peppers…nope, onions…ewe….mushrooms…NEVER. So we were pretty much strapped for what we had. Meat and cheese and some salt and pepper. I’m not saying it wasn’t good, but it wasn’t something to phone home for. Flash forward 20+ years and now I’m cooking breakfast for my kids and those ingredients that were not added when I was a child are ABSOLUTELY added these days. My kids will learn to like them, I’m sure you all know how kids are. But with time they will learn to love them! Heck I’ve finally got them to love black olives!! YES! So obviously I love quick and easy meals, but we knew this already. 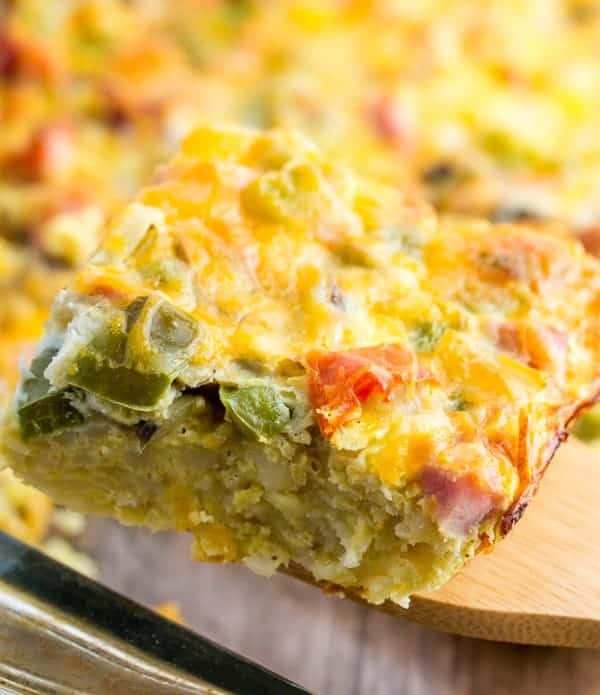 Who doesn’t love a breakfast where you can put everything in one dish, bake and it comes out to be this marvelous creation? Sign me up for any recipe that sounds like that!! Those are the ones I gravitate to. 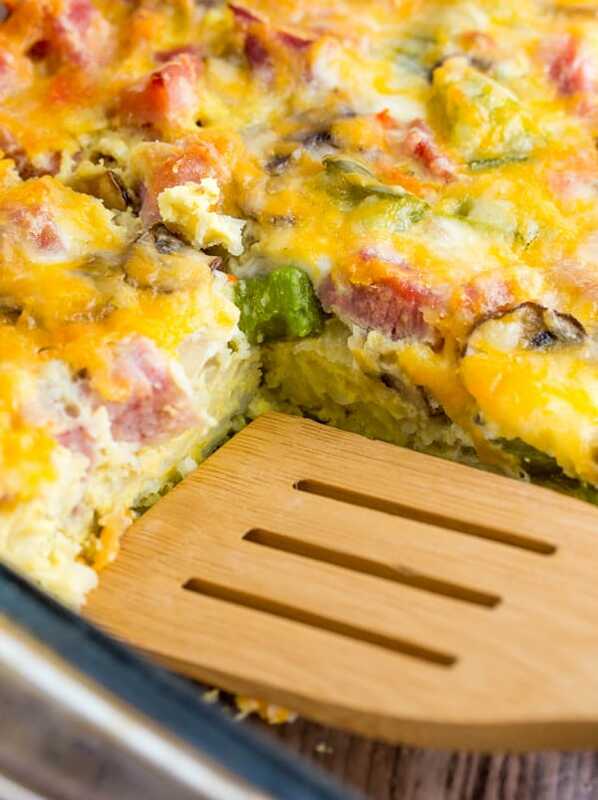 Luckily this Western Omelet Bake is just that. Ok I know I know…Western Omelets don’t usually have mushrooms in them, so if you’re not a mushroom lover, leave them out, but I LOVE mushrooms so those bad boys were added without any thought! I can add mushrooms to anything and be happy, I can thank my dad for that! 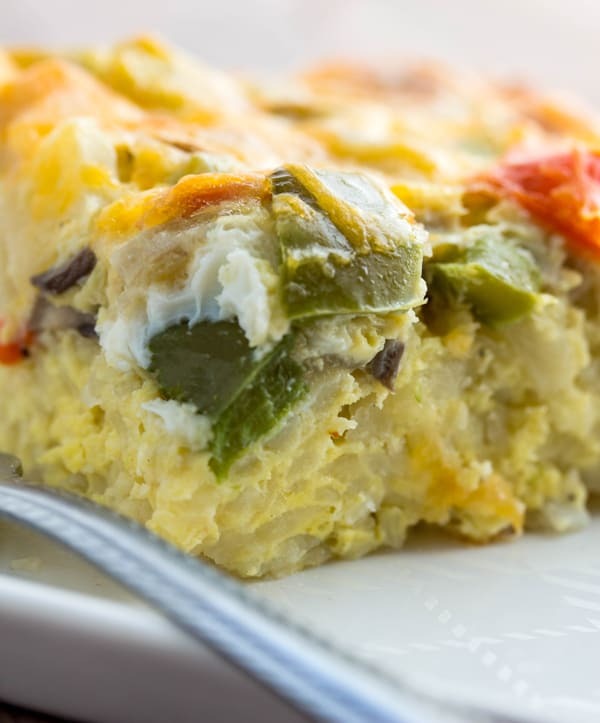 Oh and let me tell you, the crust of this Western Omelet Bake is hashbrowns!! So hashbrown layer, egg, onion, pepper and mushroom layer and cheese layer. Ok this is like the lasagna of breakfast. Aren’t my analogies just the greatest? 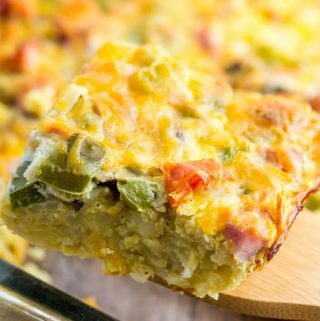 So if you’re looking to feed a crowd, love egg bakes, love quick and easy meals and lots of flavor, then this Western Omelet Bake is just the breakfast switch up that you need! In skillet saute your veggies in oil until tender. In large bowl whisk together your eggs, milk, hot sauce and salt and pepper. Then add in your vegetables and ham. In 9"x13" baking dish sprayed with cooking spray press your thrawed hashbrowns unti they cover the bottom of pan. 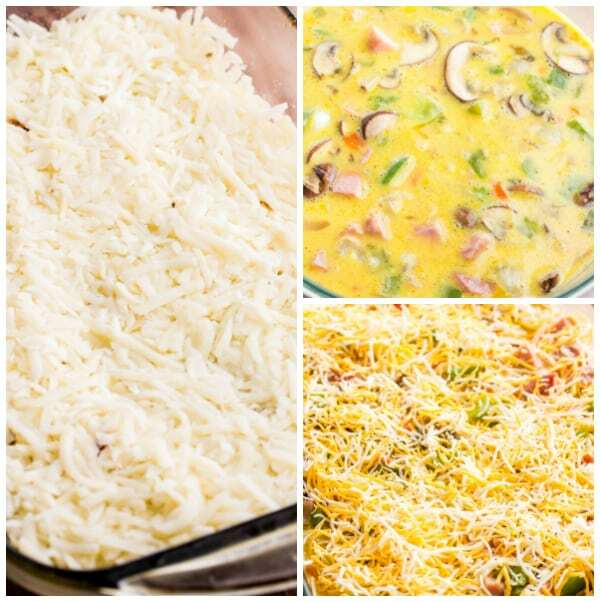 Pour your egg mixture over hashbrowns and sprinkle with cheese and more salt and pepper. Bake for about 45 minutes or until center is set and cheese is melted.